After seeing and hearing about this product all over the damn place, I decided to finally cave in and purchase The Commission Machine. This turned out to be a wise choice – it is a thorough, well produced and valuable product, and is one of the best products around on how to write great promotions. The Commission Machine – what is it? 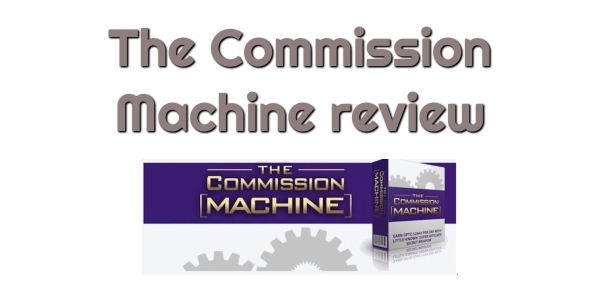 The Commission Machine is a video training product by a British top affiliate marketer named Michael Cheney. He is behind a number of products and funnels, but this is probably his most popular and well known. The Commission Machine is a quite long and thorough course on traditional affiliate marketing. It teaches how to choose a good product to promote (this is something that a lot of courses don’t teach, and it is actually very important), how to write great promotions, and how to plan and structure your promotions. The real meat of the course is in the writing, and Michael does an excellent job here. He is a great writer, speaker and educator, and I really liked his approach and style. If you are interested in email marketing and have or are building a list, I would really recommend this course, mainly for this part. I love writing and am obsessed with becoming a better writer. I think Michael’s approach to writing is fun, interesting and breaks the traditional mould. This will help you stand out and make your promotions much more effective. I honestly wish more people would take lessons from Michael’s book and apply these teachings. I would love it if the hundreds of boring promotional emails in my inbox were half as engaging and entertaining as his ones! There are also some additional lessons on how to apply these principles to Facebook, and how to combine squeeze pages with affiliate promotions to capture emails while making sales. The Commission Machine – who is it for? This product is for anyone looking to become better at choosing, writing and sending promotions. There is a particular focus on writing emails and email marketing. If you are struggling to write good promotions or get your emails read and noticed, I would particularly recommend this course. It is simply the best product I know of for teaching these skills. The Commission Machine – what are the drawbacks? The only drawback I can think of is that there is definitely a strong focus on emails. Michael Cheney does say you can use these principles on Facebook too if you don’t have a list. And while that is true to a certain extent, there are also some particular nuances to Facebook marketing which this course doesn’t go into. If you don’t have a list or want to focus more on Facebook, I would still get Commisson Machine, but I would also combine it with a course that teaches some specific tactics for Facebook engagement, such as Emoji Traffic or Instant Buyer Traffic. That way, you get the best of both worlds. You learn great writing skills from Michael Cheney, plus you learn specific tactics for Facebook engagement to take it to the next level. Overall, Commission Machine is a very polished, professional and useful product. It is the best course for teaching writing for promotions that I know of. If you’re slightly involved with or interested in email marketing, or social media marketing, you really owe it to yourself to get this course right away. It’s that simple. The Commission Machine is one of the best products I’ve picked up in the last few months.